Southern In Law: Allergy Awareness Week Giveaway! Win an Orgran Hamper! Allergy Awareness Week Giveaway! Win an Orgran Hamper! 1 in 10 babies born today will have a food allergy. And no, it's not a fad - they're not being pedantic. Food allergies can be a matter of life or death - and for the luckier ones, it can be the difference between being well or seriously ill.
Food allergies affect 1 in 10 infants and about 2 in 100 adults. Some children outgrow their food allergies - but for many, it's something they have to deal with for their entire life. The most common triggers in childhood are egg, milk, peanut and tree nuts - and other common allergies include fish, shellfish, sesame, soy and wheat. Having nannied in the past, I know how important it is to be allergy aware. As a coeliac - I know how important it is for others to be allergy aware. You might not have an allergy - but that doesn't mean you shouldn't know about them - you need to be aware of others. Next week is allergy awareness week and Allergy and Anaphylaxis Australia is challenging us all to raise awareness by painting just one fingernail for those one in ten with allergies. But I want to raise awareness too - and for that, I'm sharing the allergy friendly love with an Orgran Giveaway of all of my favourite products! Orgran is incredibly allergy aware - with all of their products gluten free, wheat free, dairy free, yeast free and egg free. The Prize: An Allergy Friendly Hamper from Orgran worth $250, containing all of my favourite Orgran Products. Including; Garlic & Parsley Pasta, Buckwheat Pancake Mix, Poppyseed Deli Crackers, All Purpose Gluten Free Plain Flour, Buckwheat Pasta, Alternative Grain Wholemeal Bread Mix, Gluten Free Self Raising Flour and Multigrain Crispbread with Quinoa plus more! 1. Post a picture on Southern In-Law's Facebook Page with your one fingernail painted for Allergy Awareness Week! 2. Share the giveaway post with your friends on Facebook - and get them to let me know you sent them! The competition is open to Australian Residents and runs until the 10th June, 2013 at 11:59PM EST. Winners must be a valid liker of Southern In-Law and Orgran's Facebook page and must have completed their entry correctly. Thank you for this fantastic giveaway. I eat sooooo much Orgran products - they taste like 'REAL' food! I am Ainsley and I am a diagnosed Coeliac. 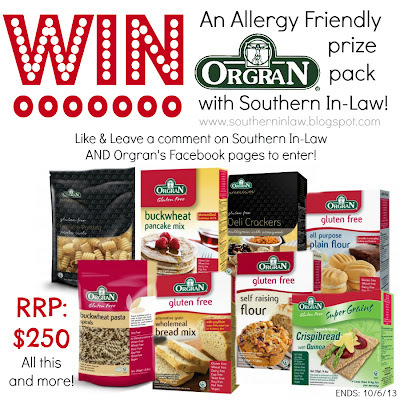 I'm Entering @Southern In-Law 's @Orgran Natural Foods Allergy Awareness Week Giveaway!" I eat a lot of Organ Natural foods and my pantry is stocked with it. thank you for this give away it is a great comp I hope I win it to share with my large family. **ENJOY cooking & eating on behalf of Orgran! 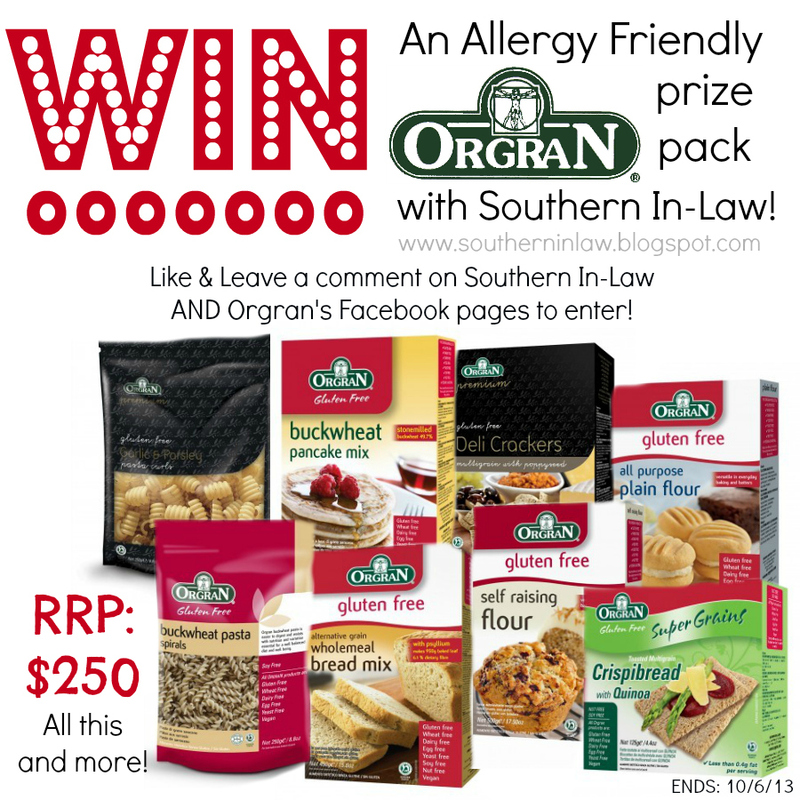 "I'm Entering @Southern In-Law 's @Orgran Natural Foods Allergy Awareness Week Giveaway!" ive liked both pages, shared the giveaway post, and tagged a friend on your page! this would be an amazing hamper! Organ products are friendly on this families stomachs as well as keeping DS behaviour in control!